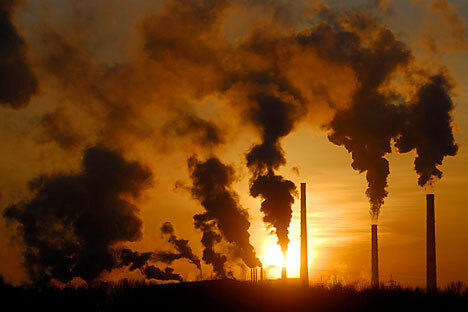 The government said it intends to reduce greenhouse gas emissions by 70-75 percent from 1990 levels by 2030. However, specialists interviewed by RIR are divided on whether the plans are realistic. On September 23, during the UN Climate Summit, the Russian Presidential Plenipotentiary on Climate Alexander Bedritsky announced that by 2030 Russia intends to reduce its greenhouse emissions by 70-75 percent from the 1990 level. The announcement is Russia's first reaction to the ecological problem after the collapse of the 2012 UN International Climate Conference, in which - almost without exception - the participating governments refused to extend the Kyoto Protocol. The Kyoto Protocol is an international agreement signed in 1997 that obliges developed and developing countries to reduce or stabilize greenhouse gas emissions. The original commitment period envisaged by the Kyoto Protocol (signed in 1997) expired in 2012. For Russia this period did not constitute a burden, since after the fall of the USSR the development of industrial production in Russia was delayed. The main source of emissions was carbon dioxide from the processing of oil, coal and gas, but these emissions did not exceed the acceptable norms. This allowed Russia to sell its unspent quotas to countries that had signed the Kyoto Protocol. Until 2012 Russia was the second biggest seller of unspent quotas in the world after China. However, there was a small demand for these quotas and therefore only a small part of them made it onto the market. The principal buyers of Russian unspent quotas were the Czech Republic, Poland and Japan. After the economic crisis in Europe, world demand decreased even more. In order to extend the agreement and continue trading quotas from 2013 onward, the countries participating in the protocol had to assume new obligations for reducing emissions. When the countries could not reach an agreement on the extension of the Kyoto Protocol, Russia ceased trading quotas. Yury Lapin, academic at the International Academy of Ecology, says that on one hand, the Kyoto quotas that many countries sell and resell to each other devalue efforts to prevent global warming, but on the other, the system is a necessary compromise. “Countries that buy quotas for greenhouse emissions still understand that they are being fined and therefore must sooner or later begin developing energy conservation technologies," he says. China, India and Brazil are currently the most active sellers of Kyoto quotas, and as before, the quotas are purchased mostly by the Europeans. The current level of emissions in Russia is about 69 percent of the 1990 level, and is still considered acceptable. According to ecology specialists interviewed by RIR, Russia should not have any difficulty in stabilizing and maintaining the volumes of greenhouse emissions at 70-75-percent of 1990 levels by 2030, especially if it utilizes its energy resources rationally. Yury Lapin argues that this is perfectly realistic “if Russia starts building industrial enterprises with new energy-conserving technologies and existing production technologies are scrapped." Alexei Kokorin, Director of the Climate and Energy Program at the Russian Department of the International Wildlife Foundation agrees. "80 percent of all of Russia's emissions is carbon dioxide from the burning of coal, oil and gas," he says. "The remaining 20 percent is the emissions from methane leakages in our gas transportation network. The announcement regarding the reduction of emission volumes by 2030 is the retransmission of our energy efficiency intentions." Anton Galenovich, first secretary of a working group at the Ministry of Finance and the Delovaya Rossiya Organization tasked with questions related to energy and ecology, stated in an interview with the Kommersant newspaper that the announced goal of reducing emissions contradicts the Energy Strategy Project through 2035 and it will be impossible to succeed without special measures on carbon regulation and government programs. However, the Russian Ministry of Natural Resources and Environment believes that the reduction of emissions is not in opposition to Russia's Energy Strategy, but only serves to complement it. "The energy strategy specifies that it is necessary to limit the burden of the fuel and energy complex on the environment, precisely with the reduction of emissions and the development of energy efficiency," said the ministry in a statement. Yury Safonov, director of the Center of Economy and Environment at the Higher School of Economics in Moscow, believes that one of the ways to develop energy efficiency could be to encourage the use of biofuel and solar energy. But specialists say that alternative energy cannot compete with oil, gas and coal, and will be unable to substantially replace the current structure of power generating systems.